Toward the end of President Barack Obama’s Rose Garden speech announcing his pick to replace the late Antonin Scalia on the Supreme Court bench, he recalled a telling anecdote from the nominee’s high-school graduation—which also happened to be my own. But even before Obama shared the story, it was on my mind. The news of Merrick Garland’s nomination had triggered a memory that stretches back more than 45 years. The date was June 7th, 1970. The place was a football field converted for the day into a graduation venue for Niles West High School. My classmates and I sat near the front of the field and our parents and families sat behind us. The Chicago area is subject to an occasional early summer heat wave—this sunny day was one of those occasions. A little background: Niles West was one of those huge suburban public schools (my high school graduation was larger than my graduation from Brandeis). It drew students from surrounding communities with significant Jewish populations, especially Lincolnwood and Skokie. The Jewish population here had swelled in the late 1960s as real-estate scare tactics led to a massive flight of the Jewish community from homes on Chicago’s South Side. My family was among the last wave from our neighborhood, and I arrived in my sophomore year—a city kid transferred into a world with a level of homogeneity (maybe even conformity) in dress, language and ideas that often left me feeling like an alien. While the school pep rallies left me with the impression that many kids just lived for sports, there was actually a fair amount of political activity. Many Niles West students leaned liberal to far left. I believe we were the first high school in the U.S. to have a chapter of the radical group Students for a Democratic Society (SDS)—but, to be clear, we also had a chapter of Young Republicans. In order to understand this story, you also need to recall that this was a time when America was deeply divided. Just a month before graduation, we were all shocked by the shootings of students at Kent State. In the aftermath, it wasn’t just the school radicals who were upset. A group of the honors students went to the principal’s office to demand that the school’s flag be flown at half-mast—my first political protest. I think that Dr. Mannos was so surprised to see this normally quiet group of kids in his office that he was compelled to go along. By graduation day, tensions were running high. There were two student speakers on the program: Lee Eiden, the cartoonist for the school paper, who was elected to speak by the student body (undoubtedly expecting him to be funny), and Merrick Garland, the class of ’70 valedictorian. Lee spoke first. It turned out he had no intention of being humorous. He denounced American policy in Vietnam and the institutions that supported that war. Within a few minutes, we could hear rumblings from the parents’ section of the field. Then the rumblings became full-blown catcalls: People stood up, waving their fists and yelling “No commies!” and “Send him back to Russia!” This was not how any of us had pictured our graduation. Then either Dr. Mannos or some irate parent decided to pull the plug on the microphone, cutting off Lee. Now the students were as angry as the parents. 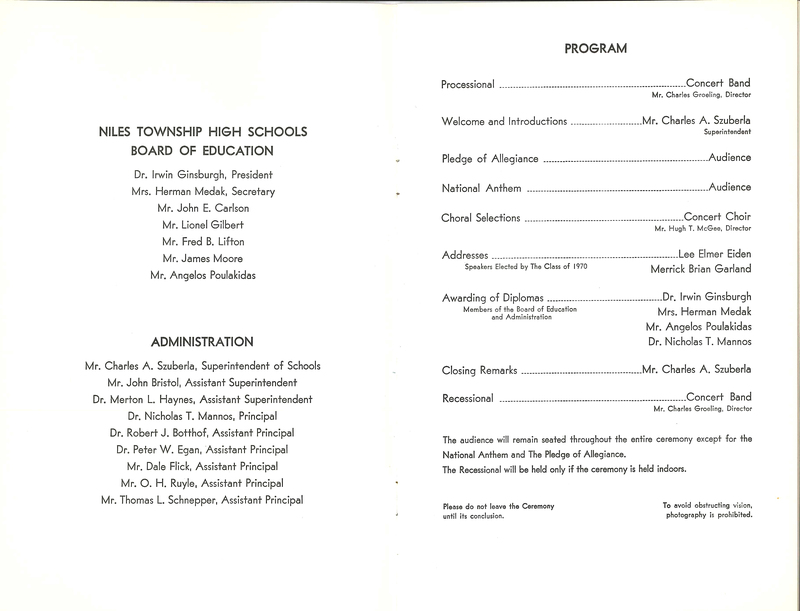 Our Niles West Commencement program. Chaos broke out shortly after the choral selection. Amid this chaos, our 18-year-old valedictorian stepped onto the stage. Even at that young age, Merrick carried himself in a way that commanded respect. He stepped up to the podium and started by visibly pushing aside his prepared remarks. As he began to speak, the crowd grew quiet. He launched into an impassioned defense of freedom of expression and of a society that could accept dissent. People who moments before had been enraged were left speechless by the maturity of this kid. Dr. Mannos appeared to hang his head in shame that he had failed to show the leadership that this boy demonstrated. We did have one activity in common in our senior year: Merrick and I were both members of the It’s Academic/Prep Bowl quiz team. To be more precise, Merrick was the captain of team when we won the 1969-70 Prep Bowl quiz tournament against our archrival, New Trier. I was the second substitute: If two people got sick, I would get to play. In the meantime, my job was to come up with practice questions at our team meetings and cheer us to victory on our way to the top. Thinking back on that experience, my strongest recollection is that Merrick was one of a handful of kids who grew up in Lincolnwood who never treated me as an undeserving immigrant to the neighborhood, a geeky city kid who couldn’t fit in. He never made me feel that because I was a back-bencher and he was the captain that I wasn’t a contributing member of the team. In short, he was a mensch. One of my clearest memories of June 7th is that, after graduation, I turned to my parents and said, “Someday, Merrick is going to be president of the United States.” Well, Merrick Garland made it to the Rose Garden after all—maybe not as president, but still displaying the unrivaled courage that I witnessed in his youth. Marvin Pinkert is the executive director of the Jewish Museum of Maryland. His original piece can be found on the Jewish Museum of Maryland blog here.